Source: "Unichi Hiratsuka, Sosaku-Hanga Master" website of the grandchildren of the artist http://www.unichihiratsuka.com/and as footnoted. Hiratsuka was one of the two most prominent leaders of the sosaku hanga movement, along with Onchi Kōshirō (1891-1955). In 1935 Hiratsuka taught the first woodblock printing course at the Tokyo School of Fine Arts. He moved to Washington D.C. in 1962, and spent thirty three years in the States. While living in Washington DC, he was commissioned by three standing Presidents to carve woodblock prints of National Landmarks, which included the Lincoln Memorial, the Washington Monument and the Library of Congress which are in the collections of The National Gallery and Freer Gallery today. Hiratsuka was awarded the Order of Cultural Merit by the Japanese government in 1970. In 1991, the Hiratsuka Unichi Print Museum was opened in Suzaka, Naga Prefecture. He returned to Japan in 1994 for his final years. I hadn't really made up my mind to be an artist till, when I was eighteen, Ishii Hakutei (1882-1958) came to Matsue. I studied with him for the month he taught there, and when he praised one of my water colors, that did it. I waited until I was twenty-one and then I came to Tokyo and enrolled in the art school of Okada Saburosuke (1869-1939). Okada was a great academician and I stayed in his school for five or six years, but I felt much closer to Ishii, and it was to him that I kept going to show my work and get advice. He was really my teacher. I've never stopped learning from him. Those were the days when the creative print [sosaku hanga] movement was being born. Kanae Yamamoto and Ishii were the heart of it, and when one day I told Ishii that I had always been interested in making prints, I hit on something he was deeply excited about. He insisted that the day of the creative print was not far off and urged me to study print-making seriously. On his advice I went to the artisan Bonkotsu Igami to study the technique of carving. ...Igami set me to learning how to carve the blocks for reproductions of traditional ukiyoe color prints. He made me work hard on difficult carving techniques like the hair on the face, and he forbade me to work on my own pictures. I had six months of this training, and then he told me I had the fundamentals and dismissed me to go my own way. Hiratsuka's training with Igami made him "the most professionally trained carver of all the sosaku-hanga artists"3 and he passed that skill on to other artists, including the renowned sosaku hanga artist Munakata Shiko (1903-1975). 1 Modern Japanese Prints: An Art Reborn, Oliver Statler, Charles E. Tuttle Company, 1956, p. 36-37. 2 Speaking of the influence of Western art on his work Hiratsuka said "Western art gave me my technique but Japanese art gave me my approach." Ibid. p. 39. 3 Modern Japanese Woodblock Prints - The Early Years, Helen Merritt, University of Hawaii Press, 1998, p. 201. Source: Modern Japanese Woodblock Prints - The Early Years, Helen Merritt, University of Hawaii Press, 1998, p.276-278. 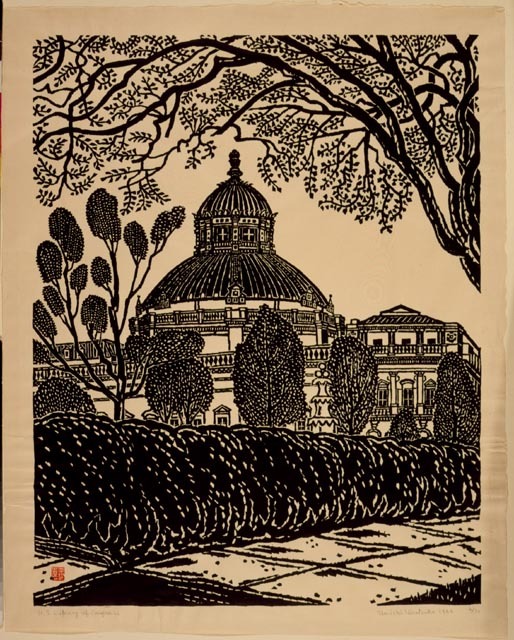 In 1929 Hiratsuka, along with seven other artists and the publisher Nakajima Jutaro, undertook the creation of the series Shin Tokyo hayakkei (One Hundred Views of Tokyo). The series goal was to depict the modern city of Tokyo that arose after the devastating 1923 earthquake. Hiratsuka contributed the first print in the series Nihonbashi (IHL Cat. #392). He also contributed eleven other prints including IHL Cat. #180, Shinobazu Pond in Snow. The other artists contributing to this series were Fujimori Shizuo (1891-1943), Fukazawa Sakuichi (1896-1947), Henmi Takashi (1895-1944), Kawakami Sumio (1895-1972), Maekawa Senpan (1888-1960), Onchi Kōshirō (1891-1955), Shimozawa Kihachiro (1901-1984), and Suwa Kanenori (1897-1932) all members of Nihon Sosaku Hanga Kyokai. The prints were published by the Takujo group through Nakajima Jutaro of the publishing firm called Nihon Sosaku Hanga Club. 1 "Shin Tokyo Hyakkei: The Eastern Capital Revisited by the Modern Print Artists," James B. Austin from the magazine Ukiyo-e Art A Journal of the Japan Ukiyo-e Society, No. 14, 1966. Source: Modern Japanese Woodblock Prints - The Early Years, Helen Merritt, University of Hawaii Press, 1998, p. 204, 208 and as footnoted. Hiratsuka was also a collector and the influence, both physical and spiritual, of the things he collected is seen in his work. Originally intrigued by foreign textbooks which he collected at a young age, he expanded his collecting to Buddhist prints and rubbings, roof tiles, Judaica and bibles in various languages. 1In 1919, inspired by his visit to Russia, the woodblock artist Yamamoto Kanae set up classes to train farmers and their families to create art and crafts to supplement their income. The farmers' art movement was popular and spread nationally through the 1920s until financial problems brought on, in part, by the authorities dislike of Kanae’s past socialist associations caused its demise. 2 Hiratsuka: Modern Master, Helen Merritt, et. al., Art Institute of Chicago, 2001, p.14. "To me black and white have always been the most beautiful of colors. For some subjects I feel that I must go into other colors, but I know that generally my work weakens when I do. 1 Japanese Wood-block Prints, Shizuya Fujikake, Japan Travel Bureau, 1938 revised 1949, p. 146. 2 Modern Japanese Prints: An Art Reborn, Oliver Statler, Charles E. Tuttle Company, 1956, p. 37. In 1962 at the age of 65 Hiratsuka moved to Washington D.C. where his daughter Keiko Moore lived. In the U.S. he continued teaching and exhibiting. He sketched and created prints of many D.C. landmarks including the below print of the Library of Congress. Library of Congress, Washington, D.C. , 1966. Woodblock print, 31 in. x 24 1/2 in. 1 Hiratsuka: Modern Master, Helen Merritt, et. al., Art Institute of Chicago, 2001, p.19. While Hiratsuka often spoke of returning to Japan during the 33 years he spent in the U.S. it was not until late 1994 that he did return. A retrospective of his work in 1996 was staged at the Hitaki Ukiyo-e Museum in Yokohama and in 1991 the Hiratsuka Unichi Print Museum (http://www5.ocn.ne.jp/~su-bunka/hanga.htm) was established in the City of Suzaka in Nagano prefecture. Hiratsuka passed away on November 18, 1997 at the age of 102. His wife of 80 years, Teruno, passed away shortly thereafter. Hiratsuka left a legacy of writings on the art of woodblock and hundreds of prints over 200 of which are in the collection of the Chicago Art Institute. Hiratsuka's given name is seen as "Un'ichi", "Un-ichi" and "Unichi". 1 Hiratsuka: Modern Master, Helen Merritt, et. al., Art Institute of Chicago, 2001, p. 117. 1 Modern Japanese Prints: An Art Reborn, Oliver Statler, Charles E. Tuttle Company, 1956, p. 41. 2 Hiratsuka: Modern Master, Helen Merritt, et. al., Art Institute of Chicago, 2001, p. 35. Leading artist of sôsaku hanga, creative prints in modern-era Japan, Hiratsuka Un’ichi (1895-1997) mastered all areas of the art of carving and printing woodblocks, and also exhibited rare talent as teacher of the techniques, which gave him the name “god of the woodblock print”. His 80-year long career in print-making will be here to evaluate through as many as 300 of his works housed in the collection combined with items held in trust. After a break of 20 years, this major retrospective exhibition is once again on display, tracing the magic of the vivid multi-colored printing that began in the Taishô Era (1912-26), to the new developments made post-war in powerful black-and-white composition. Hiratsuka's works reside in collections worldwide including: Tokyo Museum of Modern Art; Smithsonian Institution, Washington, DC; Boston Museum of Fine Arts; New York Metropolitan Museum; Rockefeller Foundation, New York; Library of Congress, Washington, DC, the British Museum, London and the Chicago Art Institute; Honolulu Academy of Arts; Cincinnati Art Museum; Carnegie Museum of Art, Pittsburgh.